I've added and subtracted a couple of things from the site recently. Removed the annoying right-side bar from any forum pages since it bugged even me. I've also added a couple of new forums which you might not notice if you have a bookmark that goes right into the Wolfeboro section. It's mainly just general stuff. "Things That Amuse Us" could be kind of fun. If you have a hobby that you feel strongly about, let us know. I know people here value their anonymity in a big way, so if you're not comfortable, I get that. I stopped valuing my anonymity in 1999 when my name officially became linked to "xrayspx". Now I feel like my Internet blather has to be somewhat more considered as a result. I know that anything I write anywhere can easily be traced back to me, so I tend to think twice before posting, it's not a bad practice anyway I guess. Anyway, start posting if you'd like. It's not just me throwing a board out there, I really am interested by what other people do with themselves. I'm also still working a little on the tag-based image gallery. I want to find a way to randomize the images so it's not always the same top 10, and include links to the Flickr streams of the photographers, instead of being just static. Flickr doesn't seem to offer the first, they allow you to return results based on "latest posted" and "interestingness", and they will return a given page number of results, but not "return x random images". I might have to force it in unnatural ways. I love the "Recent Posts" feature, which I just numbed up to. With it I found posts that I had missed before. It's a great new(?) feature. Click the My Account link on the left, choose the Subscriptions tab, and select the content types you'd like to subscribe to. Unfortunately it doesn't look like you can be notified of every new comment, but really who would want to be. 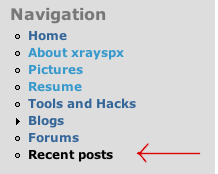 You can also subscribe to new comments in forum topics you haven't posted in by opening the topic and, above the comments, clicking "subscribe", that will drop down a menu and you can select "subscribe to this page". That way you don't have to post in a topic to get comment notifications on that topic, so if you just want to follow some comments before diving in, that works well. I can't see it. (the recent posts) Could it be because I never sign out? Re: I can't see it. I have to admit, I don't know that I ever clicked on it until OC said something, and yeah, it's pretty worthwhile. Perhaps I put it there. What say X? That isn't there on mine. If it was always on there I should have it. But I will log out anyway and see if that brings it up. It is there now! Yea! x, notice of new posts is sent to our email. Is there any way we can unsubscribe to that? Navigate to "My Account -> Subscription (tab)", then click "Settings". That will expand a menu with a bunch of checkboxes. If you want to stop getting mail from the site altogether, you can just un-check everything on that page. It also allows you to merge notifications into one mail/hour, rather than 10 emails when 10 different replies happen, which is how I'm handling it. Thanks, that sounds interesting. I will have to think about if I want to do it this way. Right now I hate deleting all those emails. Another question, x. I need to delete some PMs. I started doing it one by one. Is there a way I can do all of them? Is there a way I can do all of them? Annoyingly, it looks like "no". I'll try and see if there's some switch I can flip when I get back home tomorrow to let people bulk-select PMs. I think the "Digest" feature is pretty good for me. I have actually spent some time trying to get immediate notifications, and then I realized that I really don't need that feature, and that it would annoy us with constant mails. I will try and get them to kick off at the top of the hour though, instead of 1/4 to.